Not only can name badges help employees enter and exit a building, they can be good tools for enhanced safety. That way, security guards know whether an individual works in the building or not. Regardless of what a customer wants included on their name badge label design, we have the tools you need to create unique tags that meet their standards. 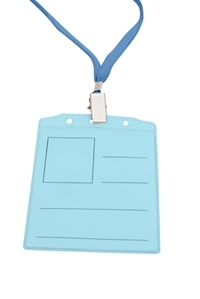 Words, photos or other images can be included on employee or visitor badges. Whatever your consumers need, DuraFast Label Company can assist you in designing your own name badges. How can I print my own name badges? By printing your name badges in-house, you are saving money and time - two very valuable assets for any business. For example, should an employee's name be misprinted, you do not have to send out to a third party or wait for the new copy to come back. Or, if a customer has put in a request for new types of name badges, there is one less step to provide them with quality tags. With an Epson TM-C3400 color label printer, you can produce professional name badges on bright, white labels, or on white matte and white high-gloss finishes. These choices ensure that you can design anything from employee IDs to visitor tags. While many companies are still in black and white options, the Epson printer lets your business print IDs in full color. Additionally, white matte and white high-gloss finishes have good water resistance properties, so they might be better suited for businesses that have employees who will be outside on a regular basis and encounter various weather conditions. Why use DuraFast name badges? When you invest in label design software from DuraFast Label Company, you are ensuring that your company has durable name badges and that you will never again fall behind on customer orders. Our name badges can be fine-tuned to meet your business' needs. DuraFast name badges are 4 inches by 3 inches and can be printed and torn at the perforation for easy insertion into name badge holders. We also have 4-inch and 3-inch continuous rolls that can be cut to the needed length by using the industrial strength cutter included with the TM-C3400 color printer. Contact one of our label experts today to find the right software and color label printer that can best keep you ahead of the competition.